It sits on the top of the Chilean archipelago, that region of the country where much of the mainland seems to crumble into islands. Charles Darwin visited during the summer of 1834, and wrote about it in his diaries. Chilean novelist Isabel Allende used it as the setting for her latest book, Maya’s Notebook. Before he became president, Sebastian Piñera acquired 118,000 thousand hectares of land on the island’s south side and turned it into a nature park (http://www.parquetantauco.cl/). 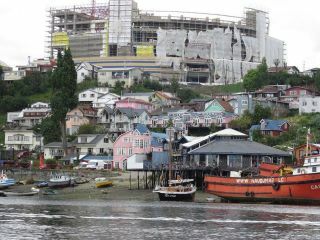 Now it seems Chiloe Island is going to have a large modern shopping mall, much to the disgust of many architects, historical preservationists and environmental groups. The island’s unique architectural style has earned many of its buildings a UNESCO designation as World Heritage Sites. The mall is going up near the Iglesia San Francisco, one of Chiloe’s churches which UNESCO says “represents a unique example in Latin America of an outstanding form of ecclesiastical architecture” dating from the time of the Jesuit missions in the 17th and 18th centuries http://whc.unesco.org/en/list/971.